When King Mohammed VI announced broad changes to Morocco’s constitution in March, he signaled a shift from an absolute to a constitutional monarchy. The new, elected government that results from these changes will be accountable to parliament, have an independent judiciary, offer a more decentralized governance system, provide broader individual liberties and offer women the same chance of winning elected office as men. The changes came suddenly. 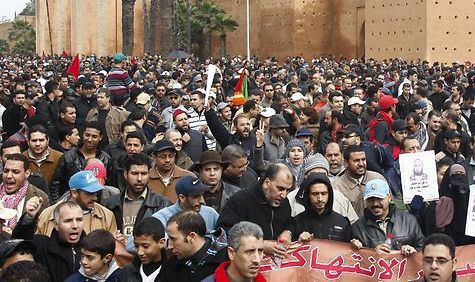 Before massive protests erupted in Morocco on Feb. 20 — part of the upheaval that has swept across North Africa and elsewhere in the Middle East — the political scene seemed stagnant; no political party was pressing for constitutional changes. On that day, however, protesters in more than 50 Moroccan cities called to set boundaries on the king’s powers and hand over the executive prerogatives to an elected government that voters can hold accountable. The king apparently received the message, although he did not make any explicit reference to the protests in his speech. Shift executive power from the king to the prime minister. The prime minister will serve as the head of the executive branch and is fully responsible for the government, the civil service and the implementation of the government’s agenda. In the current constitution, the prime minister is responsible only for coordinating activities among the ministers of government. With the prime minister selected from the political party that enjoys a majority in parliament, parties will need to develop their economic and social platforms. Shift power from the king to electors. The revisions will change the process of naming the prime minister, who under the current constitution is appointed by the king regardless of election results. Expand the scope of the legislative domain and provide parliament with new powers. The legislative domain is explicitly restricted in the current constitution. Any legal issue not explicitly mentioned as being part of the domain of law belongs to the regulatory field, and can be handled by governmental decrees. The legislative process grants dominance to the executive branch over parliament. The government controls the agenda of parliament and gives priority to bills it submits to parliament over those initiated by members of parliament. Finally, the government can legislate between regular parliamentary sessions. As such, the constitution has allowed the parliament to delegate its legislative power to the government. Strengthen the judiciary and guarantee its independence. Morocco’s constitution sets out the principle of judicial independence. In practice, however, the judiciary is subject to executive influence. The king serves as chairman of the Judiciary Supreme Council that is mandated to manage judges’ careers (nomination, promotion, mobility and disciplinary sanctions). In addition, the Ministry of Justice sets the agenda for the council’s quarterly meetings and submits the council’s recommendations to the king, who issues final decisions. Shift power and resources from the center to the regions. The revisions will empower regional councils that are directly elected by voters instead of regional representatives of the executive (mainly the Ministry of Interior). Promote participation by women in managing public affairs and promote their political rights. The new constitution is expected to favor equal access by men and women to elected office. It would likely include mechanisms to promote women’s representation in parliament and on local councils, and to guarantee a certain number of seats for women in parliament. Strengthen the rule of law, expand personal freedoms and ensure human rights in political, economic, social and cultural areas. The preamble of the constitution is expected to explicitly affirm Morocco’s commitment to human rights as universally recognized. Morocco’s Amazigh identity will also be mentioned in the constitution and the Amazigh language will be made an official national language in addition to Arabic. The planned changes will not lead to a parliamentary constitution in Morocco, but they will introduce the separation of powers and reduce the king’s all-powerful role in government. As a result, political parties and civil society should remain vigilant about the changes and seize the opportunity of regional upheaval to push for additional reforms. Political parties play a pivotal role in any well-functioning constitutional democracy. They should allow a new generation of political leaders to emerge and open their doors to youth who no longer trust politics or parties. Compared to those of other countries in the region, Morocco’s political system has become much more open over the last decade, but political leaders lacked a strategic vision and adopted a purely opportunistic behavior, trading requests for political reforms for ministerial portfolios and other private benefits. They cannot blame the regime for all of their woes. Now that youth outside the political parties have pushed for constitutional changes, political parties must heed the message. No effective democracy can be achieved with closed, archaic and fragmented political parties. It’s time for them to change along with Morocco’s constitution.